The Magus – Magician in the Rider-Waite tradition – is the second of the trumps, following the Fool. The Magus corresponds to the second Hebrew letter, Beit. Beit is the first letter of the Tanakh (rather than Aleph, the first letter of the Hebrew alphabet), and so is in a way associated with the act of creation. The original pictographic meaning of the letter Beit is that of house or tent; specifically the house of the Lord. This again ties back to the idea of creation, as God created his Temple (his house) so that he would have somewhere to reside in the lower realms. His “house,” though, consisted of all of the Jewish people, each of whom carried a part of the Lord with them. The Hebrew people were created so that God could dwell in them and also so that they might conquer and make for themselves a kingdom in the name of the Lord. The Magus is in control of his own inner house; he is the Master of the House. The Magus, then, represents the divine spirit in each and every one of us. The Magus is the House of the Lord, providing the link between the mortal realm and the higher realm. While the Fool seeks a union of the two realms through ascension, the Magus seeks a union through descending. In the Rider-Waite art, the Magus holds aloft a two-sided candle in one hand, while the other points down at the ground; a common symbol of channeling divine power from above down to the Earth. 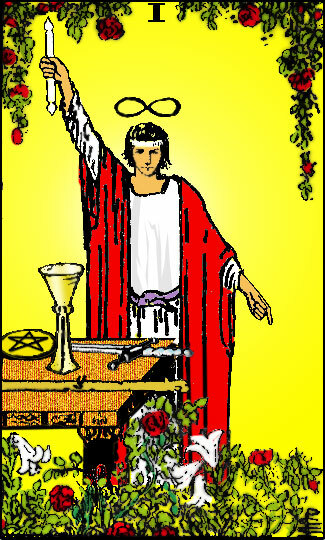 In serving as this bridge of sorts, the Magus represents both Air (Heaven) and Earth (Earth), applying the vast array of knowledge he has to the art of creation, as seen by the four tools on the table before him: a wand, a cup, a sword, and a pentacle – the four suits making up all of existence. The Magus is an active manipulator, using his intelligence and knowledge to actively manipulate the world around him. The Magus’ chosen tool is the Wand, associating him with Fire – yet at the same time, he is also the epitome of the intellectual, and so is associated also with Air. In his function as the representative of the divine on Earth, he also represents the grounding of divine logic, and so is associated with Earth. The Magus is represented in Astrology by Mercury. Mercury – or Hermes, or Thoth – is the messenger of the Gods, active and swift, able to move and speak with great clarity and reason. He is well-loved, as be brings people the Word, and has great charisma. He represents energy sent forth, and the outer aspects and image that one projects. He has tremendous force of Will, He is a fabulous orator, able to convince others to follow him, and also is a tremendous intellectual and scholar. He knows everything about the world, and knows also how to manipulate it (Mercury is known as being a trickster of sorts as well). The Magus is wise, and is able to think and express himself clearly over any medium. He is capable and confident, able to create, manipulate, and judge. The Magus also represents in many ways the “ideal” man; confident, assertive, knowledgeable, creative, active, and wise. He knows the mysteries of the divine and is close to Hod through his knowledge; he is the counterpart of the High Priestess. Unlike her, he is not half-hidden or mysterious; he feels no need to hide his power, and strides confidently through space, doing what he wills. 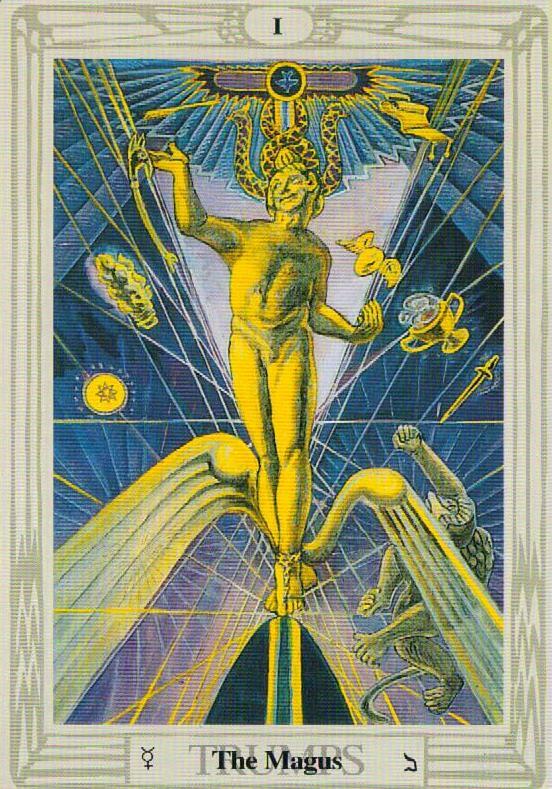 This can be seen clearly in the Thoth art, as the wing-footed Magus floats through space, creation stretching all around him, reaching out and interacting with everything (again, the four suits appear on this card). He is also a sort of prophet, able to spread divine words of wisdom to others, as he has knowledge of infinity (the symbol of infinity appears above his head in the Rider-Waite card, and the caduceus appears. His words, however, can be distorted and misheard by others, as seen by the Ape at his feet. When looking at the Tree of Life, the Magus is the path between Kether (Spiritual Perfection and Emanation) and Binah (Understanding and Potential). In this regard, his role as bringer of the divine Word from Kether to allow others to understand their potential is emphasized. He connects the wisdom and Perfection of Kether to the Understanding and Potential of Binah, serving as a teacher and mediator between the intellectual realm of understanding and the spiritual truth behind things, using the energy of Kether to actively bring the message of God to the masses (Binah can also represent duality and passivity) who listen attentively for enlightenment. In a reading, this card asks you to examine the role that activity, conscious manipulation, and words of wisdom play in your life. It suggests that you think about how messengers have influenced your life, and of how you influence the world around you and project an external image of yourself. Reversed, this card’s energies are blocked, hidden, or twisted somehow; the Magus in your life is hidden, or you do not hear their magic. Maybe you are unconsciously changing the world around you to a far greater extent than you mean to. Reversed, the Ape of Distortion becomes dominant, and the true words of the Magus are distorted and misunderstood. This entry was posted on June 11, 2011 by Z. M. Wilmot. It was filed under Tarot .